On our new 140 acre farm outside of Amery, Wisconsin, we have a very scenic and diverse mixture of tillable land, pasture, woods, a pond and a stream running through it all! Our farm is home to 40 100% pasture-raised heritage bred hogs. These animals help us to improve our soil through their manure as well as rooting and pecking the ground we have them on. They love to eat quack grass and our veggie scraps! We value this composting cycle that keeps our inputs lower and helps keep our pigs and chickens fed. On our farm there are about 70 acres of tillable land. 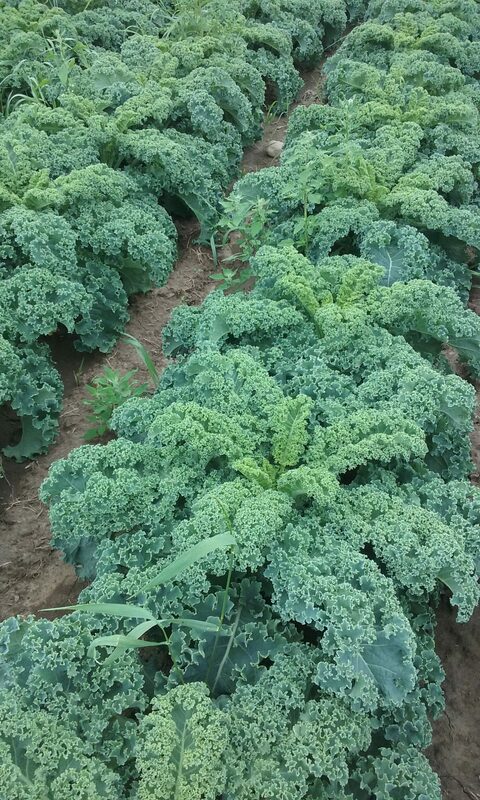 We currently grow 10 acres of Certified Organic Vegetable crops. The remaining acres are in either alfalfa hay or are in cover crop for next years’ vegetables, or are being used for our pigs. Since this is a new farm for us, we are currently creating a several year rotation plan that includes vegetable, animals, cover crops and hay. Ideally, a vegetable farm will have a rotation that grows vegetables for only year at a time on a certain chunk of land. 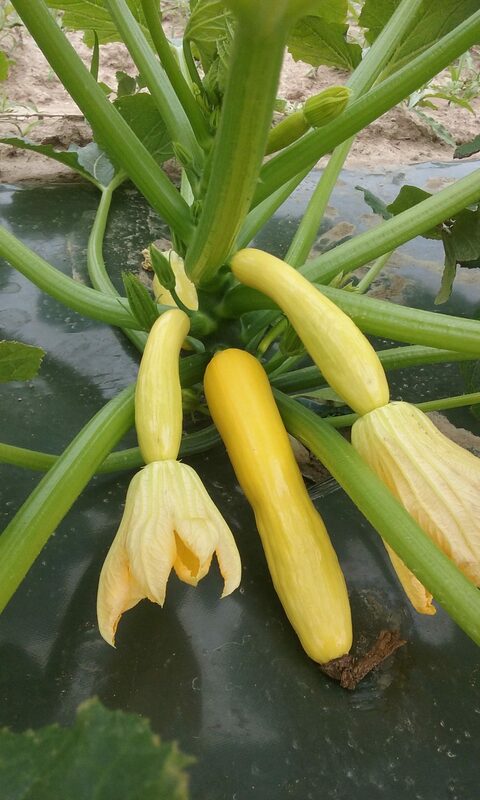 Since vegetables take lots of nutrients off the land this rotation, using cover crops and animals, will help restore and build the nutrients and soil that is so needed on a vegetable farm. As much as the weeds are a focus on farm, pests can be too. 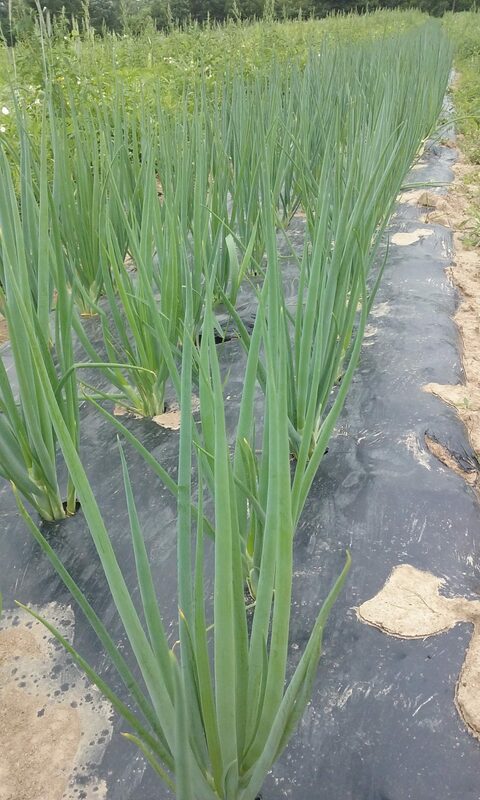 Our strategy is to use row cover (used as a barrier), timed plantings (avoiding certain pest hatching periods), companion planting, an electric fence for deer (for many crops including peas, beets, carrots and brassica) and raccoons (for the sweet corn), and most importantly keeping our transplants and seedlings happy and healthy. When a plant is stressed, it is much more prone to pest pressure and diseases. As CSA farmers, we grow over 65 crops and it can be difficult to stay tuned into every single plant all the time. So, this is harder said than done, but our weekly “walk-about” helps us prioritize and plan for the week ahead making it easier to feel connected with each crop. We hope you can come out to the farm for a visit or to help in the fields and see what a day is like on our farm!